You don’t need to be a “fashionista” to see that there are real liberatory powers in the way she manipulates the fashion press. Like a lot of people, I found myself curious to see what Michelle Obama would wear to the inaugural ceremonies yesterday. The breathless and frankly idiotic tone of most fashion journalism aside—The New York Times described her recent choices as having “enough of a story,” a meaningless phrase always employed without much elaboration—her manipulation of its hyperbolic lunacy often puts me in a state of awe. This is a woman who always manages to own the picture. And she does so without either looking “like a model” (another of those meaningless phrases) or succumbing wholesale to the lily-white cluelessness of the fashion establishment, often choosing designers of color, like Jason Wu or Isabel Toledo. I feel wary writing of this. It’s an old trope of the left to complain that fashion is “unimportant.” (See Kevin Drum’s latest salvo at Mother Jones, for example.) Of course, I know and have all the standard leftist objections to focusing on her outfits. I worry that to place too many fashion burdens (or plaudits) on women is to put them at a structural disadvantage, because keeping up with fashion is definitionally about buying new things, and so: rather expensive. I also think too much of the discourse on fashion is too removed from the material realities of how clothes and textiles are produced in this world—which is to say often in terrible labor conditions. This is what made that speech Meryl Streep gave in The Devil Wears Prada about the “importance” of the fashion industry so risible—because in her description of the large-scale capitalist enterprise that is the fashion industry, she acted like capitalism is a good in itself, no matter the inequalities it produces, which is: gross. Yet the first lady’s distinctive outfits, just as an example, have a way of undermining certain strictures on women even as they focus our gaze on the clothes. For one thing, Michelle Obama’s style, put bluntly, might be said to be that of caring very much to look exactly like herself, not like the “first lady.” (Mea culpa for that first mention in this paragraph.) There’s something both defiant and self-knowing about it, in that it’s not the plain pantsuits of yore, and yet the aura it projects is “control.” And that isn’t even to get into how looking exactly like yourself is still a novelty for an African-American woman in the pallid, debased and retrograde culture of high fashion in America, and also pretty much everywhere else. The fashion industry’s total lack of apology for its racism, and its embrace of body-policing, are legendary, facts so much already in evidence I don’t even need to argue them to you. Like it or not, that industry and its images have shaped the self-perception, self-esteem and, consequently, yes, the liberation of women in ways that are crucial to their having a role in public life. You don’t grow up in a culture that still retains a belief that women are aesthetic objects, and emerge unmarked by it. African-American women who have never seen themselves reflected in prominent images of beauty happen to have the bluntest claim here, but I’d say even white women often get it: if we are going to be judged on the way we look (and we are), it’s at least preferable that we feel some measure of control over it. None of us think that control is total, but degrees count, in matters of self-esteem. And forbidding anyone even small succor on grounds of alleged “triviality” isn’t just wrong—it’s actually reactionary. Knock off the attempts to drive people out of the public sphere for your abstract ideas about importance, please. And if self-esteem isn’t the same as structural change, well: the two do have some connection. Of course, I can only speculate about whether Michelle Obama’s undermining of the fashion industry itself is conscious and deliberate. But it’s inarguable that the enormous commercial power Michelle Obama wields—people just want to buy what she’s wearing—is shaking up some of its comfortable assumptions about what counts as “beauty” or “class.” Those are words that have always been wielded to keep people out. But increasingly, in the Obama era, their definition is becoming more democratic, not totally so, but open to more bodies and skin tones and hell, just people than they have been in the past. And manipulation is not capitulation, even if we’d love to do away with the whole beauty business altogether. But activists don’t get to choose the world they change; they’re stuck with the clothes in the closet, imperfect though they are. 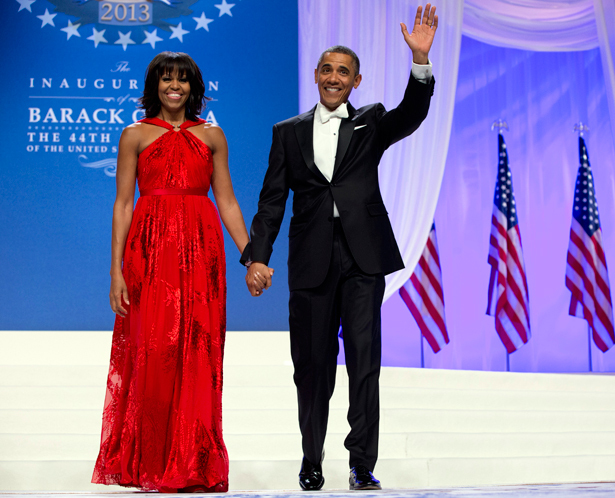 Except Michelle Obama’s wardrobe, of course, which is near-perfect. For more on the weekend's festivities, read John Nichols's analysis of President Obama's inauguration speech.